See Driving Directions > Eastern Sierra for context and how to get here. See this popup local area map showing Big Pine south to Lone Pine (look for waypoint BIGPIN). 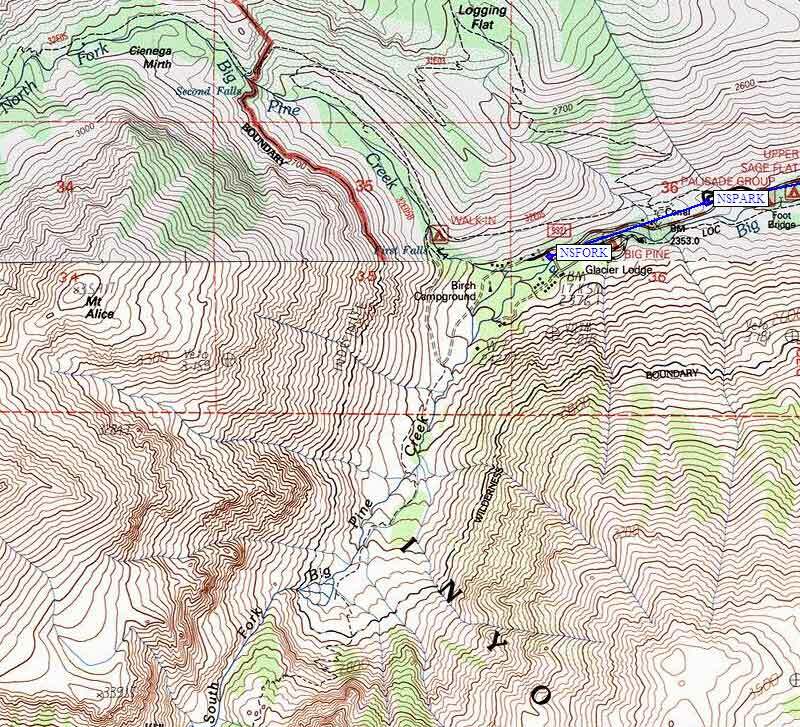 View the waypoint file (above) for GPS Routes BIG PINE CREEK and HWY 395 BIG PINE TO LONE PINE. About 11 miles from Big Pine you'll hit the end of the road: There is only day use parking at the start of the North Fork and South Fork trails (waypoint NSFORK). There is a pit toilet and a bear box here, and most people drop their packs off at the trailhead (NSFORK) before parking just over half a mile downhill at the backpacker's parking lot (waypoint NSPARK) and walking back to their pack. There are several bear boxes and some more toilets at the backpacker parking lot. The South Fork (of Big Pine Creek) trail goes slightly uphill from the day use trailhead, then crosses the North Fork and drops into the South Fork drainage. Expect lots of mosquitoes around Willow Lake! This is the trail to Brainard and Finger lakes (for Sill, Gayley, Temple Crag, Middle Palisade, Norman Clyde, Southfork Pass, etc). The North Fork (of Big Pine Creek) trail can be reached from the day use trailhead, but there is a more efficient trail that sidehills up directly from the backpacker's parking lot. You may get confused by the pack station, but the trail goes above it and stays well above the old road (now closed at the day use parking area due to an un-fixed washout many years ago). This is the trail to 'the numbered lakes' (First Lake through Seventh Lake), Sam Mack Meadow and the Palisade Glacier (for eastern approaches to the V Notch, U Notch, Winchell, Thunderbolt, North Palisade, Polemonium, Sill, Temple Crag, etc).